Are you looking for something different? Something that says "Autumn Fresh", but not something that's typical? 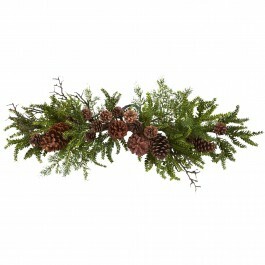 Then look no further than this striking 30" Green and Pine Swag. Brown, bumpy faux pinecones come intertwined with pine greenery to create a crisp-looking decoration that will freshen up any room. Also makes the perfect gift for that person who has everything. 30" x 7" x 5"